An Analog Rig for Everyman? 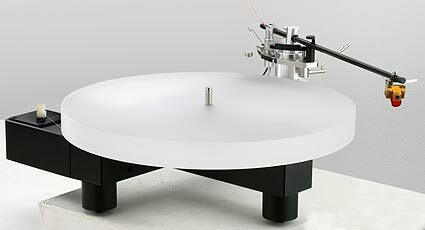 I recently received an email from Rachel Zhang of Grant Fidelity offering me the first crack at the new entry level Opera-Consonance LP6.1 turntable and TP988 arm combination. As my plate has been pretty full these days (and I am trying to abort an overflow situation) I nearly passed on it. But the more I looked at the information she sent, and the price ($1325 sans cartridge but including shipping in North America with a special introductory price of $995 shipped) I became more and more intrigued. Throw in the fact that my good friend and fellow Enjoy the Music.com reviewer Scott Faller owns (and loves) his top of the line Opera Droplet 5.0 ($5700 plus arm and cartridge.) We may not always see eye to eye on speakers (or politics) but when it comes to analog, I trust his judgment. Who am I kidding? What the hell- ship it! I will fit it in somehow. After I received the turntable, I sent an e-mail to advise of its safe delivery. That's when Rachel told me how this turntable came about. She and her partner Ian Grant had seen the turntable and arm on a recent factory visit to China. They convinced the factory to allow them to import the 6.1 and TP988 to North America, telling them that especially now, with our economy in the dumper (my words, probably not theirs), we North Americans needed high performance, relatively low cost hi-fi. The first combination shipped to North America is happily spinning in my system as I write. The Opera 6.1 turntable is simplicity at its finest. Think of a crucifix. Now make it from heavy gauge steel, and lay it on its back. Put the bearing were the north south and east west bars meet. The Japanese motor assembly resides within the short section at the rear, and has built in fine tuning potentiometer, and is powered by a generic wall wart power supply. The long section to the right is pre-drilled to accommodate the Consonance TP988 tonearm. Underneath are three quality footers. Speed selection is accomplished by moving the included "belt" (really it is monofilament fishing line) on the exposed motor pulley topside. I really like that the Opera 6.1 does not have an outboard motor pod: while I can see the advantage (isolation from noise and vibration) I loathe them. They always seem to need adjustment- move the turntable or pod to dust, and you must reset the belt tension. The included motor appears to be of high quality: I never heard any type of motor noise, even at high volume. The platter is made of a slab of 1 inch acrylic, topped with a stiff felt mat. The platter and mat are slightly less than 12 inches, allowing the playing surface of the LP to rest securely upon the mat, while leaving the outer lip of the LP floating free. A couple of observations here: the spindle is unusually tall, allowing the use of nearly any make or model of aftermarket mat desired. Also, should one be so inclined, one can move the arm mount to accommodate the 12-inch Consonance TP1288 ($795 with an introductory price of $695, or $100 additional at time of purchase) for lower tracking error. Here is where things get very interesting. 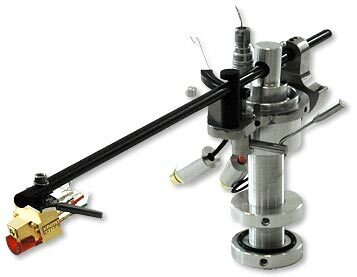 What we have here is an oil damped unipivit tonearm with a 9-inch effective length, the arm tube itself being made of carbon fiber. I've not seen a carbon fiber arm tube at anywhere near the price of the TP988. (Also available separately at $695, with an introductory price of $595.) The reason for carbon fiber is simple: lower mass and greater rigidity. The unipivot design is up for debate. The advantage is much lower friction as opposed to a gimbal equipped tonearm, as there are no bearings on each side of the tonearm near the pivot point. There is a point on the underside of the arm wand that rides atop a bearing in an oil soaked bath. Because there are no side bearings, the arm can freely "rock" from side to side. This is the downside. As the arm rides record warp, it is prone to rocking, and changing the orientation of the stylus from side to side (azimuth) as it rides within record groove. Which camp you fall into is a personal choice: roll the dice and pay the price. While I can see the logic, I never detected any issues tracking warped LPs with the TP988. The user can of course experiment with lubrication. Those that wish to do so are encouraged to check out this link, provided by Grant Fidelity. I can also see people with large LP collections having multiple arm wands: one holding a stereo cartridge one holding a mono cartridge. As the wiring plugs into the top of the arm base, and VTA is easily adjustable, it would only take a couple of minutes to swap arm wands, especially if one were to use a fine point Sharpie to mark the bottom of the arm mount for the proper VTA for each cartridge. Numerous counterweights are included to facilitate cartridge matching. North American buyers are covered by a two year parts and labor warranty. Setup was very straightforward. I had the Opera-Consonance LP6.1 and TP988 up and running in about an hour. The instructions are clear and concise, which has not always been my experience with products imported from China. The text is also reinforced with excellent photographs. 5. Trial fit arm base on the plinth. 19. Connect to phono stage and enjoy! I did run into one snag during setup. The cueing assembly did not work properly- when the cueing lever was in the up position the stylus was still in the groove. This was easily remedied. There is a 3mm Allen bolt the holds the cueing assembly in place. I loosened the bolt, raised the assembly, and tightened the bolt and it worked perfectly. 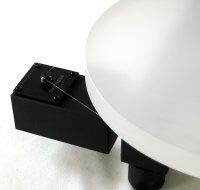 Concerning cartridge azimuth, this can be adjusted with the Opera-Consonance T988 arm. What we are trying to accomplish is make sure that the cantilever is perfectly perpendicular to the record groove. If the cartridge body is tilted to the left or right when viewed from the front, there will be unequal signal output from the cartridge, shifting the sound either to the left or the right, which also negatively affects imaging. While one can try to "eyeball" azimuth, to adjust this perfectly one really needs a good test record, such as Hi Fi News and Record Review Test Record, which is heartily recommended. To adjust azimuth on the T988 gently rotate the arm tube to the left or the right as needed. One (of many things) that I really like about the T988 is that all of the adjustments needed to get the most information out of the grooves are able to be performed. Many lower priced arms do not have any sort of azimuth adjustment possible. The rest of the rig was my reference setup that can be seen here. The only exception is that amplification varied between my Bella Extreme 3205 Signature MKII amplifier/ Juicy Music Peach preamplifier and the most excellent Manley Laboratories Stingray iTube integrated ($3400, review seen here) running in triode mode. When the Opera-Consonance LP6.1 and TP988 combination was offered for review, Rachel also asked if I needed a cartridge as well. I have my "Dynavector by Sound Smith" custom- a DV10XL with a ruby cantilever fitted with a line contact stylus, which is honestly not the right cartridge for this table- no one is going to (or should) spend $1000 on a cartridge for a $1325 turntable. I also have a Denon DL110 ($139), which is a fantastic cartridge for the money but may not be "enough" cartridge for the Opera-Consonance. Rachel offered to send a Dynavector DV10x5 ($430 in the United States). When the shipment arrived, I was surprised to find a Dynavector DV20XL ($750 in the United States) in the DV10x5 box! While I have no experience with the DV10x5, I owned a DV10x4MkII for some time years ago, before I upgraded to the DV20XL. The main reason for the upgrade was that I had a couple of unfortunate incidents with wiped out cantilevers- one my fault; one was the child of a houseguest. The upgrade was mainly due to the fact the 20X series comes with a stylus guard, something the 10X series sorely lacked. And although Mike Pranka, the Dynavector distributor for the United States was great about replacing the cartridge at a reduced cost under his "oops" policy (something he does for everyone, not just reviewers) it was still costing me cash each time it happened. When the DV20XL arrived, I was rather underwhelmed -- it sounded very close to the lower model. Remembering this, I decided to mount the DV20XL to the TP988 and proceed with the review. Also, I have years of listening experience with the DV10XL, so it all worked out well in the end. Record lovers will often debate over the "best" pressings of their favorite albums. The Opera-Consonance LP6.1 with the TP988 reminded me that the "best" pressing is system dependent, save the Beatles catalog, where I have always preferred the U.K. Parlophones to any Capitol release. While looking through my collection, I came across the 30th Anniversary Edition of Pink Floyd's 1973 landmark Dark Side of the Moon [EMI SHVL804] a version that I had not listened to very often, as I prefer the Mobile Fidelity Sound Labs release. [MFSL 1-017] I usually prefer the MoFi version for its extended bottom end as well as improved warmth over the EMI remaster. On the Opera-Consonance, I preferred the EMI, as I heard extra clarity in the midrange, and although it didn't have the warmth of the MoFi, I found that it sounded more "together"- more like a live performance and less like a recording. Another LP that caught me by surprise was Crosby, Stills and Nash's debut [Classic Records/Atlantic SD8229] While I have always loved the music I have always hated the sound quality of this album. The low frequency politeness of the Opera-Consonance LP6.1/TP988 combo really helped this record. I always found the sound to be thick, muddy, and slow. It irritates me to the point that I rarely listen to it. With the Opera-Consonance rig, most of the mud is gone: the music goes from being caked in mud to just a small layer of grunge: still far removed from the best sounding LPs in my collection, but it has transformed from an LP I generally ignore to one that I find at least listenable. Let's visit some female vocals, shall we? I'm a rock and roll guy at heart, but sometimes, I just need a break. I enjoy some jazz, so I pulled out Dinah Washington - The Jazz Sides [Mercury EMS-2-401 2LPs] a 1976 reissue of some of her sides from the mid to late 1950s. "Blue Gardenia" features a saxophone as well a hollow body electric jazz guitar of some sort- yes you can hear that is definitely not an early Fender or Gibson solid body. The performance is spellbinding- the whole album sounds fantastic. Many recordings from the 1950's had a beautiful, immediate, and realistic quality that I find largely missing today. As far as Washington's voice, the liner notes state: "There are all kinds of singers. Somehow, Dinah made most of the others sound like little girls." I agree. Dinah knows what she wants (put your mind in the gutter.) Great stuff- highly recommended. Flea market types and dumpster divers will be very well served by the Opera-Consonance combo. I was shocked at the dramatic reduction in surface noise while playing older, less than pristine vinyl on this setup. In fact, I spent one evening searching out "well loved" LPs in my collection. Most sounded as if they were nearly new. I called Scott and asked him what was going on- this rig costs roughly 25 percent of my reference rig, and while I prefer most LPs played on my own setup, the Opera-Consonance rig positively destroyed the Sota/Audiomods setup while playing worn vinyl. Scott believes it is a combination of the carbon fiber arm wand along with oil damping that is doing the trick. Whatever it is, it works- the difference is night and day. While I have found Dynavector cartridges very forgiving in general when it comes to surface noise, this is a whole new ballgame- the improvement is that profound. The difference between the two setups, as far as surface noise, is similar to the difference between playing a dirty versus clean record on my reference rig. When it was first released, I purchased the Beatles Yellow Submarine Songtrackon yellow vinyl. [EMI 7243 5 21481 1 0] I got a dud pressing: there was a "whoosh whoosh" noise in the grooves on side one between "Yellow Submarine" and "Hey Bulldog." It drove me nuts. Eventually, I caved and purchased a second copy form a different store. Same thing- to say that I was pissed is putting it mildly. The noise is still there on the Opera-Consonance rig, but it far less noticeable. Especially in analog, when one spends more, one gets more- more resolution, more nuances, simply more music, and usually surface noise goes down as the price goes up. With the lower priced rig, I lost most of the irritating surface noise, along with some of the drama and impact of the music. For those who have heard Yellow Submarine Songtrack, gone are the extra impact and slam of Paul's bass guitar and Ringo's drum kit: Songtrackon the Opera Consonance sounds more like the original mixes. The vocals and orchestration, however, were positively magical. Not a bad trade off, considering the price. Are you in the mood for a full-on head banging musical assault? I can't think of a better choice right now than AC/DC's Let There Be Rock. [Epic/Sony 80203] Remastered in 2003 by George Marino at Sterling Sound, this one is a real powerhouse- real AC/DC before the tragic passing of vocalist Bon Scott. Listening to the opening track "Problem Child" I am reminded that this is a lower priced rig, while the drums are sufficiently detailed, they lack the impact and slam of my reference rig. The vocals and guitars, however, are crystal clear, and the Opera- Consonance setup gives a good portrayal of front to rear depth. At the end of the day, it is not a fair comparison- the SOTA's platter alone weighs roughly 1.5 times what the entire Opera-Consonance rig weighs- better isolation from outside forces equals better information retrieval. It is probable that a change in cartridge would have changed my opinion at least somewhat concerning the bass performance, possibly at the expense of the seductive midrange using the Dynavector. I was unfortunately unable to mount my Denon DL110 on the business end of the TP988: the screws I have on hand were just a hair too short. In short, those who own smaller, stand-mounted loudspeakers with limited low frequency extension should be thrilled with the LP6.1/TP988. If it sounds as If I am being harsh, I do not mean to be. There is a whole lot of goodness here, especially for the money. I did stumble across a worthwhile tweak: the SOTA Reflex Clamp ($245). Due to the 6.1's unusually tall spindle, it just barely fit. And while it seems to make little difference on my SOTA Star, it made an audible improvement in all aspects of performance with the 6.1, most notably bass weight and definition. I really liked the Opera-Consonance LP6.1 and T988 combo! In fact there is only one major fault. The T988s arm wand cannot be secured to the arm rest. Someone could easily bump the arm, sending it careening out into space, and possibly damaging the cantilever. For this reason, I would only recommend use of this unit with cartridges having stylus protectors, and care must be taken to ensure that the stylus guard be put in place after each use. While the Opera-Consonance LP6.1 and TP988 combination is far less expensive than my reference rig, I never felt as if I was "slumming." While my SOTA Star Series III/Audio Mods/Dynavector rig easily bested the Opera-Consonance setup in bass extension and authority, I found the midrange performance beguiling with the Opera-Consonance, and the upper ranges weren't too shabby either. I am reminded of road racing: it's not necessarily raw horsepower that wins the race. A car with a big displacement engine can easily be left in the dust by the smaller car with a smaller engine but superior handling and driver combination. The Opera-Consonance LP6.1/TP988 combo is not only a joy to use and listen to, but once I got past the "form follows function" appearance, I realized that it is also a thing of beauty. The entry level Opera-Consonance can not only be easily recommended for those who want their first "serious" turntable, but in these trying economic times, those who may feel the need to "step down" will be well served by the LP6.1/TP988 combo as well. I could easily live with it long term, and will miss it when it is gone. Just a thought- a refurbished Garrard 301 in a proper plinth (Loricraft or Shindo) with the Consonance TP1288 running a Dynavector Karat 17D3 cartridge... .hmmm... might be my new "dream rig." Sorry about sending you the wrong cartridge. I found the 10x5 in the DV20X box getting ready for RMAF. Too bad, because the 10x5 is a better match for this and the Droplet 3.1 tables and ST988 arms, especially if you lean towards rock, blues etc over audiophile jazz etc. The 10x5 is a much meatier cartridge -- not as refined as the pricier models, but more balanced. When thinking cartridges for the Opera line of turntables, keep in mind that the price of these tables is much less that their performance/cost ratio. One reviewer of the Droplet 5.1 is actually suggesting $10,000+ cartridges for the $6700 table and arm.